Venture features a built-in background slideshow that sits behind your logo, menu and banner content. Creating single or multiple background slideshows is as easy as selecting your folder and clicking save. Bootstrap is not required for the Venture template to operate with basic Joomla content views however if you need Bootstrap you can use our selective implementation tool to add the various required bootstrap elements to your design. It's easy to add your required bootstrap elements without adding the entire bootstrap library. The Zen Grid Framework v4 is proving to be very popular with Joomla speed freaks. It's a flexible framework with an eye on performace. Venture is fast because it does most of it's processing behind the scene and not when your page loads. It also comes with a plethora of options for improving performance including gzipping assets, compressing assets as well as other cdn options. It's simple to add a google font to your website via the template's administrator panel. Choose any of the fonts available on the Google web font directory to truly personalise the character of your website theme. Zentools is a responsive image and content gallery module that makes it possible to create a myriad of layouts and designs. It is an all in one responsive module that is capable of generating slideshows, carousels, grids, accordions and more. It's a popular choice for users looking for a simple single solution for their module needs. Venture also features a range of menu tools for creating dropdown, vertical, accordion and offcanvas menus. The Zenmenu plugin makes it possible to add icons, subtitles and multi-column menus to any core Joomla menu module. Venture also offers the ability to connect your site to your social networks. Add social sharing for facebook, google plus, pinterest and twitter at the click of a button. 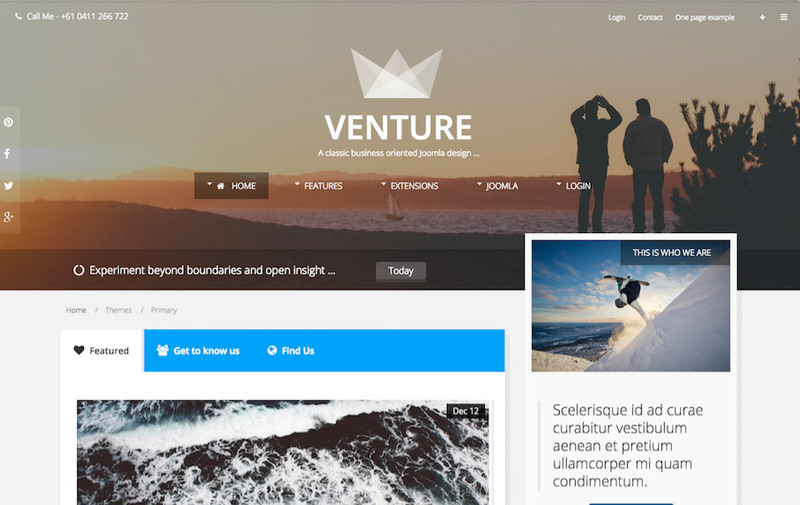 Venture also features the ability to create a simple one page smooth scrolling design. The Venture demo showcases this function. One page make it possible to use your main navigation to scroll to specified anchor points on your page. One page mode works perfectly on mobile devices via the offcanvas or toggle menu options.